Black Engineering Services ( BES ) is a sole proprietorship located in Largo Florida. It has been in existence since 1979. We do hardware and software designs specializing in the area of analog circuits, small processor systems and software. In software design the emphasis is on real time servo control. Our staff has over 40 years of experience. Mr. Black has an engineering degree from the University of Florida and is a registered engineer in the State of Florida. As a sole proprietorship the business is also fully registered with the state. When necessary BES has been known to team with other fully qualified local consultants in order to extend design capabilities and breadth of knowledge. The picture shown on the main page is a tracking system that was demonstrated at Cape Canaveral by a customer. The control board for the system was designed in part by BES and the bulk of the control program was written by BES. The whole control system design was a joint effort of Elektron Systems Inc. ( ELEKSYS.COM ) and BES. The mechanical and system wiring designs, and the fabrication was done by our customer. The board illustrated to the left is a design that was done several years ago for a customer. Actually it is part of the system described in the last paragraph.. 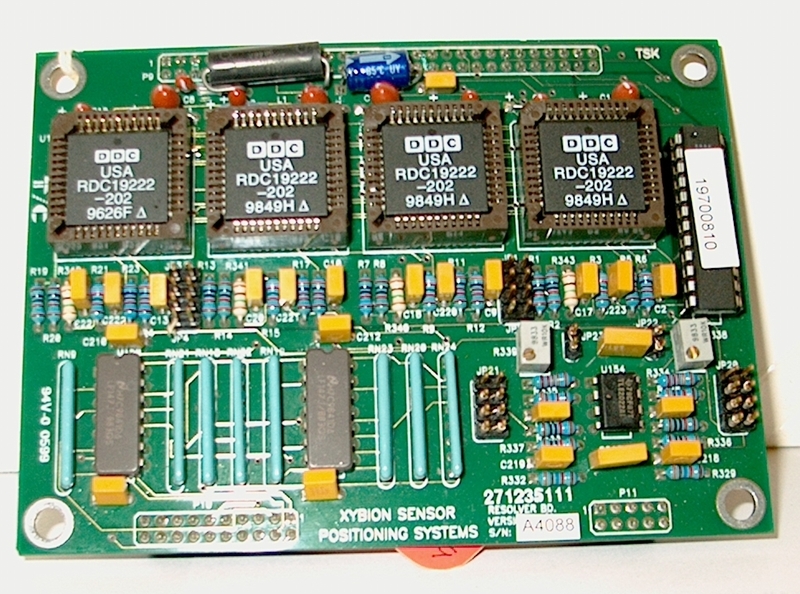 This board is a daughter board designed to provide four channels of resolver to digital conversion. Typically these systems have dual speed resolvers in each axis. As a result the board only supples two axes of data. With this setup it is possible to derive a high resolution output for the angle data from each axis. The algorithm and a prior design is discussed in a paper jointly authored by myself and another engineer and presented by me at the SPIE show in Orlando. This paper was published in the “Proceedings of SPIE” Volume 641, “Acquisition, Tracking, and Pointing” pages 144-147, 1986. It is the intent of BES to provide our customers with high quality products or services designed to meet or exceed customer's requirements in a timely fashion. To this end BES maintains a collaborative association with other talented individuals and consultants to maintain the ability to expand where necessary as required for any project. As well as the usual collection of computers. printers & plotters!